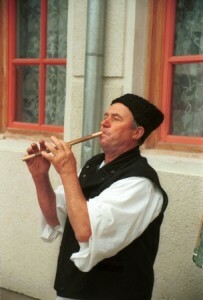 The common fluier is the equivalent to the tin whistle, but made out of wood with the lower aperture of reduced diameter. These are found all over the Balkans. In Transsylvania it is known as trişcă. The larger version is known as the fluieroi. The tin whistle comes in various sizes with the largest known as the fluier mare or caval and the smallest known as the fluieraş or trişcă. The end blown (not stopped) smaller ” fluieraş ” and the larger “fluierul mare” are types of “fluier” are found in Moldavia, particularly in Bucovina. The Dobrogean “fluier” is a variant found in Dobrogea which is similar to the small “fluier” of Moldavia. 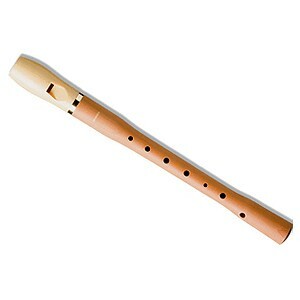 It has a seventh hole for the thumb (like a recorder) and is made of reed. The end-blown “fluier” is a cylindrical tube open at both ends, like the tilinca, made of wood or metal with six finger holes. End blown pipes are also found in some surrounding countries: Floyera (Greece), Salamayyia (Egypt), Shupelka (Bulgaria), Soplika (Ukraine). 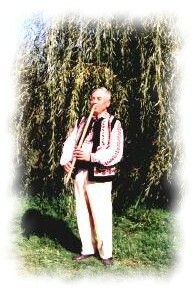 Similar instruments found in surrounding countries are known as: Frula (Serbia), Duduk (Bulgaria), Dentsvika (Ukraine), Dudka (Ukraine), Duduk (Serbian Vlach), floghera (Greece), fluier (Romania), furulya (Hungary), fujarka (Poland), Jedinca (Croatia), ovcharska svirka (Turkey).